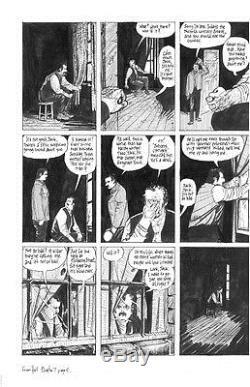 This is an original page of art from the legendary FROM HELL graphic novel by Alan Moore & Eddie Campbell! This is page #13 from Chapter 7. A great "stand alone" page telling a story within the story. Beautifully illustrated by Eddie Campbell. The original page measures 11x17. The item "FROM HELL Original Art, Chptr 7, Pg 13 by Alan Moore & Eddie Campbell" is in sale since Tuesday, November 22, 2016. This item is in the category "Collectibles\Comics\Original Comic Art\Covers". The seller is "poo666" and is located in Aptos, California. This item can be shipped to North, South, or Latin America, to all countries in Europe, to Australia, to Japan, to China, KR, ID, to Taiwan, ZA, TH, to Hong Kong, IL, to New Zealand, SG, SA, AE, QA, KW, BH, MY.